BART is a regional heavy rail system serving San Francisco, San Francisco International Airport and through the Transbay Tube to Oakland and other east bay cities in Alameda and Contra Costa counties. 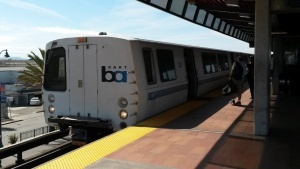 BART connects with Caltrain and Amtrak along with many local transit systems including Muni, AC Transit, SamTrans, County Connection, Tri Delta Transit, Union City Transit, and Wheels. In additional to local bus systems, shuttles offered by many entities also connect BART with nearby destinations. Use the trip planner or click on the line below for individual schedules. See BART fares for fare table. Due to the planned Transbay Tube retrofit, BART is adjusting service level to create construction work window. Part of the adjustment is to push the start of weekday service 1 hour later and reducing SF service on Sundays to one line to allow single tracking. The 4am weekday service is substituted by bus. Antioch - SFO 15 min. 20-24 min. ♠ 20 min. ♠ 20 min. Richmond - Warm Springs 15 min. 20-24 min. 20 min. 20 min. Coliseum - Oakland Airport 5-20 min. 5-20 min. 5-20 min. 5-20 min. Millbrae - SFO 30 min. No service No service 20 min. Trains run from every 3 to 10 minutes in San Francisco and through the Transbay Tube. Trains operate on Sundays' frequency until midnight on weekdays and Saturdays. ‡ - Provides service between Dublin/Pleasanton to MacArthur. No SF service. ◊ - Provides service between Richmond and Daly City until 7pm. No Millbrae service. Transit service along selected BART corridors during overnight hours is provided by local bus agencies under the All Nighter brand. Select a station below or through the map above for access and parking information on individual stations. At the station, you need to buy a BART ticket from a BART ticket machine. You will keep that ticket throughout your trip on BART. Clipper cards are accepted on BART and the card can be obtained at BART stations from selected ticket machines. 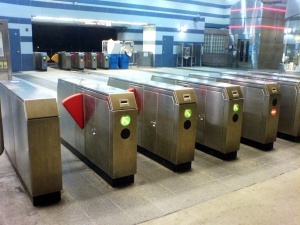 Proceed through the BART faregates with your BART ticket or Clipper card. Look for overhead signs and walk to the platform that is served by your train. On the platform, board the train that goes to your station. The overhead electronic signs on the platform will show the destination, not line color, of the trains as they arrive. The train operator may also announce the destination of the train. On the train, the train operator will announce the next station just before arrival. The train will stop and open doors at every station along the line. Once you get to the destination station, exit the BART faregates with your ticket or Clipper card. BART trains provide level boarding on all cars at all stops. All stations have elevators to provide access to station concourse and/or station platforms from the street. See the elevator advisory for elevator outage. If the elevator is out of service, contact BART station agent or its call center for directions on alternate service, including paratransit. At some stations, elevators to/from the platforms stop on the station concourse outside the paid area of the station. Exiting riders are required to use the emergency swing gate to re-enter the paid area to process the fare or subject to citation. BART stations have wide faregates for disabled passengers as well as other passengers with strollers, bikes, or luggage.